In the last decade, Japanese horror movies have become more and more popular in the West. Beginning with the American remake of The Ring in 2002, and the subsequent popularity of the Japanese version, Japanese cinema has terrified audiences worldwide with their brand of dread-filled horror. Following this trend, Yen Press has released Another: Volume 1 as an ebook to American audiences, giving them a new format with which to scare themselves silly. Koichi Sakakibara is in the unenviable position of starting a new middle school in his third year. His mother died when he was less than a year old, and his father is spending a year abroad in India as an anthropologist. Since he'll be gone for a full year this time, Koichi has been sent to live with his maternal grandparents in Yomiyama. On the very day that he was supposed to begin school, he's hospitalized with a second spontaneous pneumothorax. Not completely unheard of in adolescent boys, especially those who are, like Koichi, tall and thin, it's a painfully annoyance that delays his starting in the new school. Even a strange visit from the class presidents isn't terribly reassuring. Perhaps it's just a matter of moving from a metropolis like Tokyo to a smaller town, but everyone seems just a little bit off here. Her aunt (who is closer in age to a cousin) went to the same middle school, and has been strangely elusive about the traditions and customs of his new school. When he finally does make it to class, things get even stranger. The students don't follow the normal morning routines, such as rising to address the teacher or taking attendance. And there's something strange about one of the girls in class. She doesn't interact with anyone else, and no one acknowledges her either. And her desk...is strangely old-fashioned. Part of the joy of the Japanese horror stories is the slow build that they have. To give anything more away would ruin a bit of that dread that forms, and far be it from me to break down what Ayatsuji as worked so hard to create. If this is representative of the standard Japanese horror novel, it's a crime that so few have made it to the West. One word of warning: as this is the first of two volumes, there is a rather cruel break in the story halfway through. Be warned that when you get to the end, it may be a hard wait for the rest of the tale. Highs: So many of the oddities that the narrator runs into can be explained away as coincidences or the culture of a small town, except that there are so very many of these oddities. Lows: A two-part scary story, with months between the parts, is just plain mean on the part of Yen Press. 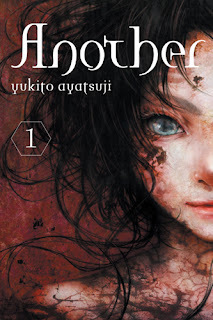 Verdict: A lovely departure from the traditional ghost story, Another: Volume 1 leaves the author wishing they read Japanese so they could find out how it ends. Neko Ramen Volume 4: We're Going Green! Kind Of... is, of course, the sequel to Neko Ramen Volume 3: A Cat After All. Check out the review for Volume 1 here, and Volume 3 here. Otherwise, read on!